Convergences: The global south and the global north in the age of great acceleration. After lots of hard work and a long wait, several crucial resources for our project are finally out in publication. David Bello, Across Forest, Steppe, and Mountain: Environment, Identity, and Empire in Qing China’s Borderlands (Cambridge University Press, 2016). This is a major addition to the steadily advancing literature on the environmental history of China and its vast and varying border regions, by a leading China specialist at Washington and Lee University. John Agbonifo, Environment and Conflict: The Place and Logic of Collective Action in the Niger Delta (Routledge, 2018). The collision between the global petroleum industry, Nigeria’s government and military, and the ethnic peoples of the Niger Delta, has been a notorious example of social and environmental degradation. This is an impressive study by a leading Nigerian historian. Jason W. Smith, To Master the Boundless Sea: The U.S. Navy, the Marine Environment, and the Cartography of Empire (University of North Carolina Press, 2018). The work of a military / environmental historian at Southern Connecticut State University, this is a substantial addition to the literature on the ecological dimensions of imperialism and military power. Sam White, The Little Ice Age and Europe’s Encounter with North America (Harvard University Press, 2017), and Dagomar Degroot, The Frigid Golden Age: Climate Change, the Little Ice Age, and the Dutch Republic, 1560-1720 (Cambridge University Press, 2018). 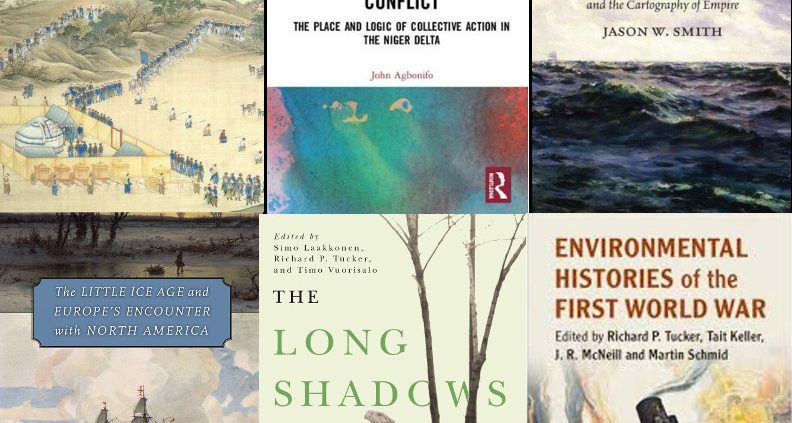 Two path-breaking works on the seventeenth century by leading climate historians, these books probe the imperial Dutch and British navies in the Age of Conquest, in the setting of environmental history. Simo Laakkonen, Richard Tucker, and Timo Vuorisalo, eds., The Long Shadows: A Global Environmental History of the Second World War (Oregon State University Press, 2017). With essays by seventeen scholars in Europe and North America, including chapters on Asia, Africa and Latin America, this is the first broadly based environmental history of the world-engulfing cataclysm. Richard P. Tucker, Tait Keller, J.R. McNeill, and Martin Schmid,eds., Environmental Histories of the First World War (Cambridge University Press, 2018). The work of fourteen scholars on four continents, this new collection complements The Long Shadows and two other multi-author volumes on the environmental history of the Second World War, which are forthcoming in 2019. • How has irregular warfare transformed or conserved environments? • How has it reconditioned everyday life? • What impact has it had on livelihoods and food access? • How were chemical cycles changed through irregular warfare? Upon acceptance, full manuscripts (2000–3000 words) should be submitted by 15 June 2019 for pre-circulation. Successful applicants will receive travel support from the RCC. They will join a group of RCC alumni and ACERN members in Florianopolis, Brazil, on the eve of the Third World Congress of Environmental History (22–26 July 2019).